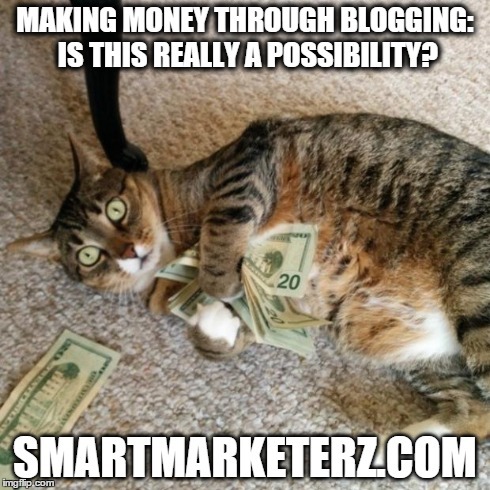 Making Money Through Blogging: Is This Really A Possibility? With issues such as job insecurity and impending economic crises around the world, there are many people who are truly desperate to try to find alternative methods of earning an income. One of the ways of doing this is generating an income online through writing. It is a known fact that blogging, for instance, can bring in a huge income each month (of course by hitting all the right buttons). However, if you read most of the online thoughts that people share, you will find that most of them tend to have a defeatist attitude towards this. For instance, most of the people will say that blogging for money does not make much sense, since you will end up putting in a lot of effort for a minimal amount of monetary compensation. However, the one thing that you need to accept right from the start is that it is certainly possible to make a decent income through blogging (and even more than “decent”!). The only thing you need to do is make sure that you keep some of the issues below in mind when you start, such that you are hitting all the right buttons. The first and most important thing you need to keep in mind when you are thinking of blogging for money is managing your expectations. You need to know how much potential blogging can bring for you, given variables such as how much of time you are willing to allocate to write the content. This will enable you to not get disappointed in your quest to earn some money through blogging. Tip : from experience, it’s better to start blogging as a passion, or a part-time hobby, while having another job, and evaluate later the possibility to transform it into a full time income. If you are thinking about blogging for money, you also need to be very keen on the kind of topic you choose to write about. For instance, if you decided to write personal memoirs, you should not expect to earn any money out of the blog unless you have very interesting stories that will draw a lot of traffic. The best way to find out which topics can be most profitable for you is by using one of the online keyword analysis tools (like Google Keyword tool, for instance), which will show you which keywords are popular. You can then build your blog around such keywords and thus gain much more traffic from search engines. One of the best ways of monetizing a blog is through the use of ads that are placed on the page. People can click on these ads (links or banners) and you will then earn part of the revenue generated by the company you work as an affiliate for. When choosing such a company, you need to consider issues such as frequency of payout as well as how much they pay per click to ensure that you do not get a raw deal. You also need to make sure that you work with an affiliate program that can provide ads that are customized according to the kind of content that you provide, so that they can be relevant to your readers. Also, be sure to try the product or the service you wish to be affiliate for, as this must be good enough to promote it to your readers. This is perhaps the one thing that determines whether you, like some of the hardworking handful, will be successful in making money through blogging or not. If, for instance, you tend to lose interest in the project early on, you will find that it is very difficult to make any significant amount of money out of your blog. By observing disciplined schedules such as posting articles regularly (and make the proper promotion), you can keep providing your readers with worthwhile content, and this will result in increased income. All in all, blogging in itself is not a get rich quick scheme. It requires determination, effort and of course ideas to make your blogging relevant as well as exposed to a huge group of readers consistently. Do you have what it takes to blog for money then? Have you reached your goals with your blog? Are you making some money with your website? Well said! I think you can’t go wrong with finding a good niche to stick with. Planning is vital. I always plan > niche > blog. Once traffic picks up, then grow your income. Not the other way around. Having a plan is definitely a must if you want to take things seriously. Be sure to work hard for few months and results will arrive. You have brought one of the main topic here. Most of bloggers want to know about making money online from their blog but fail to do that. It because they don’t write regularly. As you have just said that consistency is required. Providing quality content is very important. Having better connections help you to get more clients. Consistency is the key, together with passion and perseverance. Staying consistent is an essential factor that must be kept in mind if we must succeed with making money blogging. Yes, consistent delivery of valuable contents will eventually pay off. It is possible to make money through blogging if the right steps are taken. Being realistic with expectation is also crucial. There are times when things will not go the way we want but infusing the determination to succeed will override the gloomy moments! I kingged.com, I also left this comment. Consistency is important, but writing quality content is as much vital for your blog. This post is very hot topic of present trend , most people are choosing alternative income through blogging specially on affiliate appreciated for your time to post this wonderful article which is very useful for beginners like me thanks .. will visit regular to your blog..
Glad you liked it, Charan. Making money through blogging is indeed possible. Blogging is used for business, both small and large. Even beginners may try using this line of attack to make money. For example selling their products and services and creating a blog and share articles about what they sell, who they are, why choose them and so on may cause a good upshot. Blogging nowadays is essential to leverage business growth and be prolific. Beginners must read and understand the tips given here to start correctly, I must say. making money blogging is possible, but statistically just for few of the millions blogs started every year. Stay connected and thanks for your comment. A very simple and straight forward post you have put up here. The issue of making money from blogging has remained a widely conceived topic on the blogsophere. I can remember vividly that I was among the folks who launched a blog, put in some few content on it, splashed lots of ads, affiliate links and banners on it and then sat down with my legs crossed in expectation of the $$$$ LOL.. funny me! Well, the real proper thing has always been to blog passionately. First time I noticed I wasn’t making even a cent from my blog would have been my last to login to my WP admin if not for the passion I have for blogging. I really like your advice of telling people to make blogging a hobby, their passion, and then keep their day jobs while blogging. With time, if one is persistent and focused coupled with passion, then the issue not making money will soon be long gone! Always study yourself, evaluate yourself and find out if from the onset you have blogging as a passion because failure to do this will surely land you in trouble. Once again, it was a great read Erik and I am sharing it right away. Who has not done that in the beginning? Every inexperienced blogger thinks that it is easy to make money online. But then he changes his mind very quickly! it’s passion that makes you working hard on your project. And sooner or later, success will arrive. Thanks for taking the time to share the post. I think this is the most balanced point of view about money blogging. Neither you allured people to term it a big source of earning money nor you supported the commonly prevailing frustrations about money blogging in blogosphere. Those who can learn how to sell actually are the right people to plan for earning money with a blog. One must be by nature professional to earn money with his blog. Those who love to help others free and be proud of it can hardly become perfect professional. They can be good social worker but not the real entrepreneur. Thanks for sharing this eye-opening post with objective analysis of the topic. You always analyze the content you read, showing the most relevant points. I really appreciate your views and visit here. A respectable post about profiting from blogging. A great many people imagine that, blogging is about acquiring cash inside a night, you clarified clear way in this post, its not care for that, we can win cash through our web journal by the degree of energy, commitment and by time administration. Patience, persistance, passion and hard work are needed! You have shared a good article. People generally wish to make money from their blog/s. However, they do not take any concrete action. Also quality content with good traffic is very important.. Taking action is the first step to achieve success. Hard work is the second! I’ve been blogging for just over a year and I’ve stuck with the mindset of serving others and creating the best blog possible, I am now starting to see some money from advertising and affiliate sales. It’s definitely working and I love doing it! I think I would probably blog for free if I wasn’t able to make money. Happy to hear blogging is giving you some monetary compensation. If you are willing to blog for free, then I am sure you are very passionate about it. A decent post about making money from blogging. Most people think that, blogging is all about earning money within a night, you explained clear manner in this post, it’s not like that, we can earn money through our blog by the extent of passion, dedication and by time management. Blogging is not just posting the content you know to the readers. It’s a mixture of seo, smo, sem, affiliate marketing, leads, your hard work etc. Without these proper mixture, we can’t generate single cent with blogging. I like all the points you mentioned here, have to stick with the job till earning money from blogging, using google keyword tool, choosing proper niche etc. Thanks for sharing this wise and neat post erik. Blogging is not just writing, it’s a mixture of several other tasks. Some of them even really complicated! You mentioned wisely one need to have a proper plan before starting blog to make money online. We need to choose correct niche on which we can make profit as well as we can continue it for a long time. Rather then quitting it in future. I had made many mistake in beginning but now i know i am on right track. If you are serious at blogging, then you need to have a plan. Organization, discipline and hard work are needed. you’ll learn from your experience. That was a good tip about making a plan. That was something that I overlooked, and now I’ve had to put my blogging on hold as I review and change my ideas. Had I planned properly beforehand, I would be doing much better. Great tip, which may prevent others making the same mistake. If you want to make blogging as your job, then you need to have a plan. Passion, discipline and hard work are needed. What solid and practical tips Erik! And of course good old consistency helps but you also point out to choose your niches wisely. That’s very sound advice for sure! Thanks so much for sharing your extremely practical road map! Most people at beginning really think to make money online overnight. That’s ridiculous. And disappointing, sadly. Hard work and a good plan are needed. Consistency is required everywhere! To make money blogging, niche plays an important role as you said and yes it also depends how you monetize your blog! Thanks for the post Erik. Without consistency you can’t reach your goals. Also, having a plan helps you increase productivity and hit success. My niche is blogging/internet marketing. Your article is very informative and useful to all new bloggers like me…Thank you..
yes, it takes time indeed to get a popular blog, but it’s worth the efforts. Yes, I am agree with you that we can earn a lot with blogging but we need to keep patience and need more be tactical. As you mentioned that we should need to choose our niche very carefully on which we can write and market perfectly. All the points you cleared in a very well maintained way. if you want to take blogging seriously, then you need a plan. Thanks for sharing..! This is an awesome tips about make money blogging. Bro, I believe this is really amazing tips for newbie bloggers, on any people who want to become an entrepreneur by make extra income through writing blog post. You know..? I have been blogging almost 4 or 5 years ago, but I still not able to find out successful for myself. I have read a lot of blog post about successful and make money blogging. The bloggers almost wrote the same tips to what you have mention, but what they I found useful here is that its a common thing that we have to do in order to make money. Well, I would agree with your. Bro…! In order to make money we have to be wisely, find out the topic we are expert and wrote about it. Add associate affiliate links that fit to our contents and it’s topics. Nothing is going right in just overnight, we have to be consistent. Keep patient and enjoy what we are doing. Well, successful is on your way. Bro. Making money blogging requires patience and persistance. But most of all, it requires a plan. I think a big income may come from selling your products or services. I’m already selling services, and I’m working on a product right now. and good luck with your blog, Kim. Hi Erik, An easily understandable post for newbies like me. Why don’t you publish an article on starting off with affiliate marketing for a new blog. This will definitely be of great help to newcomers like me. Please let me have your feedback!